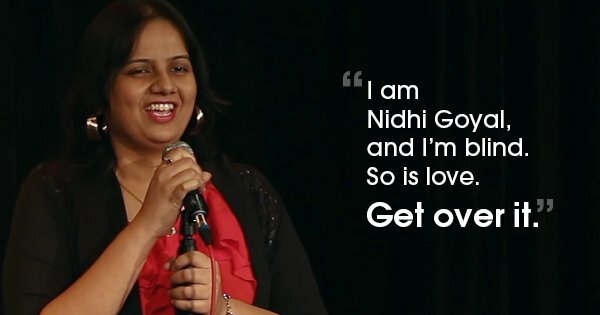 Nidhi Goyal is someone I am immensely inspired by. I came across her while watching a video by fabled Indian stand-up comedian, Aditi Mittal, and have been imbued by her greatness ever since. And, once anyone gets to know her, I wonder who would not be gobsmacked by this walking body of joy and pride! Why am I so in love with her? Well, to tell you that I would first have to introduce you to her and her greatness. So, let’s go about doing that! So, Nidhi is a lively and eye-catching artist. Someone who is masterful with her puns, and uses deftly framed sarcasm to make the crowds guffaw through the roofs. And, beyond all of that, what blows away her first-time viewers at first is the realization- She is blind. Trust me, that’s a fact hard to digest from the way she moves around smiling, with a glistening face, upright confident body with utter boldness. Oh, she simply owns the stage once she begins her show and she nails it big every single show. But, there is more to take away from the tale of this imbuing soul than just her comic prowess. She had a vision. To make sure she does not have to live with society’s pity for she had the vision problem. She did not want to be the cornerstone for society’s empathy wherever she would go. She wanted to be treated by the world the way it treats every other ordinary person. And to make that happen, her arsenal was her impeccable knack for humour. She not just spreads laughs to her viewers, her boldness actually inspires and mesmerizes. I myself was totally gobsmacked by the superlative persona she has built for herself. Such souls brimming with aplomb is not that common a sight in this ever-inundated world we live in. And, that teaches us all a very important lesson about life. It’s tough on you only if you allow it to be. And, once to turn the tables and make a commitment to not succumb to whatever difficulties come your way, nothing can actually stop you. Naught at all! What makes me sad is the propensity of most of us to give up to the travails of life when going gets a little tougher. So many of us with large pools of potential lie dormant with immense great possibilities being squandered into the dust every time one of us gives up on the shot to be something bigger and better. Almost every one of us has settled for lesser than what we always aspired to be at one juncture or the other in our lives. Many of us at one time or another have settled for mediocrity bogged by the burden of responsibilities, inhospitable environments, tough times and surroundings or whatsoever of the billion possible excuses. And, we have succumbed to all of those excuses time again, while there were souls like Nidhi who chose to be determined and not settle for anything lesser than their dreams. They make this world a beautiful place. I wonder, had all of us not given up on those respective opportunities that we once gave up on, this world would have seen so much more of colours to celebrate, paint and inspire. It would have been much more than everything it is today. There would have been so much more of goodness to embrace, experience and extrapolate. It is people like Nidhi who actually give life a taste of them. And, I can bet that life definitely loves that taste of glory which Nidhi and others like her have to offer. So many of us don’t carry forward with great opportunities citing whatever possible excuses or grousing or shifting the blame on others. Mostly we do it intentionally out of shame to accept the guilt, and at times we do it inadvertently thinking, maybe it’s the end. And, it is in such times when maybe a ray of hope or a slight inspiration can give us a much-needed thrust to get back on track and take the challenges of life head on. 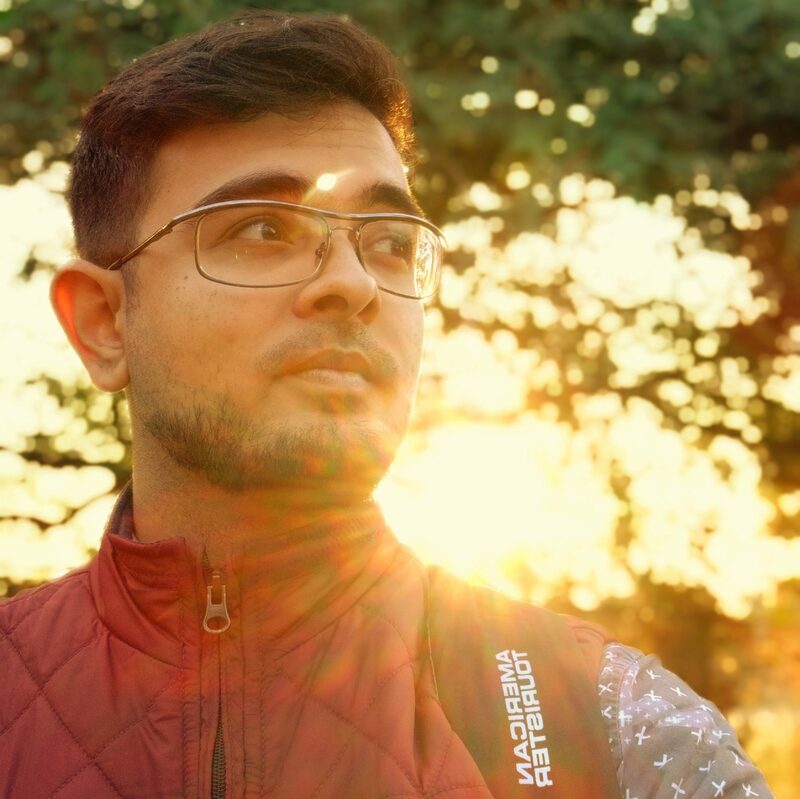 And, this post talking about one such protean and blithesome soul, Nidhi Goyal has been written with the intent to be that cherished ray of hope and inspiration for the reader this day. This post aims to give the reader a thrust to give their great sequestered potential a fillip to succeed. Ergo please, every night dream a little larger than your life made you. And, then once you wake up from that dream, strive harder and smarter than the previous day to turn that dream into a reality. In the context of this post, Nidhi did just the same. She dreamed of overcoming the societal pity for a blind citizen by empowering the best of her talent. That talent was her ability to create jokes around everything prosaic and commonplace happening all around us. And, with grit and passion, she worked hard and smart and fought her way to the top at what she does. Many of the readers would have come across the maxim- “What’s worse than being blind? Having sight but no vision.” The thing with such quotations is that they all sound so good and sacrosanct. However, we only catch the essence of such statements once we get to experience them right in front of our eyes. And, for me, Nidhi’s standup comedy has been that experience. She made me realize how being blind is not as doleful a thing but having a sense of sight but no vision at all is. Another truth she made more palpable for me was- Given one has a vision, grit and intent to be something great, nothing can stop you from doing that. The only resistance on one’s path to greatness is You. Once you give in. It’s all over. Otherwise, there is always a slight scope to climb back up the rope to success in whatever dream you wish to realize. Ergo, whatever it may be that you are stuck with in your life. Whatever you are losing out on. Whatever it is that your mind may be telling you to give up on. Just remember the tale of this laughterpreneur. Maybe you would find a way to give life a taste of you! Here is a link to Aditi Mittal’s video I talked about in the very first paragraph which made me come across Nidhi for the first time- Link. This post has also been featured at The Inspiring Indians. The Man Who Ensured He Would Never Die. The Man Who Was Dead For Six Minutes! The Man Who Went From $50 Million to $46! The Man Who Even Won His Enemy’s Heart!